If an almost perfect example of a Grade-I listed, Charles II house set in beautiful protected parkland but only an hour from London was available for £4.5m you might think there was a typo. However, it’s true but there are one or two minor catches. Firstly, Ashdown House , built in 1661, is owned by the National Trust so your £4.5m only gets you a 60-year lease (or £205 a day if that’s easier). Secondly, because it’s National Trust, the house is also open to visitors every weekend April to October (approx 2,000 last year) so that they can see the impressive staircase and ascend the 100 stairs to the viewing platform with it’s fine views over the Berkshire Downs. So, basically, this is possibly the finest second home in the country – although rather than use it at weekends you may wish to be there during the week. The current owner, Mr Max Ulfane, a businessman and well-known philanthropist, has hosted such high-profile events as fund-raising receptions for the Ashmolean Museum. Alternatively it might be possible to vary the lease to at least exclude some weekends – especially as the lease was offered with the same terms at the same price in May 2009. *Update* The Sunday Times today (24 January) says that a 83-year lease is available for £5.3m (£175 per day for anyone putting it on expenses) and that the famous artist Anish Kapoor is planning to take a look and it has already been seen by several others including a top executive at Puma. *Update* – Sept 2010 – The remaining lease has been taken by Pete Townshend of The Who. 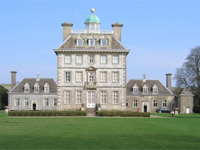 This entry was posted in for sale, News and tagged architecture, ashdown house, conservation, country house, english, grade-i, houses, listed, national trust, oxfordshire. Bookmark the permalink. With Pete Townshend, of The Who, purchasing the residual 40-year National Trust lease on Ashdown House (http://www.timesonline.co.uk/tol/news/uk/article7140275.ece), Max Ulfane, the previous lessee of 25 years, is auctioning off its contents on 27 October at Sotheby’s New Bond Street galleries in London, with an estimated value of up to £1.6m. Pete may be interested in the portraits thought to be of the 1st Earl of Craven and Elizabeth of Bohemia (sister of King Charles I), the original intended occupants of the house. Also please note that the Ashdown House lease, which includes 84.7 acres, only has 40 years remaining, as it was originally a 60-year lease starting in 1990 (and hence is actually £308 per day). Although the 3 cottages, on half an acre south of the house, are on a separate 99 year lease that started in 1993. Also included in the £4.5m asking price was a 14.83-acre freehold site east of the cottages, that comprises a Philip Jebb (http://www.philipjebb.com) 1990-designed orangery, pool and tennis court, which is valued separately at about £1.5m. I assume Townshend has acquired all three parcels of land. He may also have taken the opportunity to extent the 60 year house lease to 102 years to coincide with the cottages lease end date of 2092, at an extra cost of up to £1m, payable to the National Trust. It will be interesting to see if Pete Townshend or the National Trust bought anything.